Alex Frye says he likes the scenery out in Anchorage, Alaska. That’s certainly a good thing, because he’s going to be spending a lot of time out there starting next fall. The Hudsonville native has announced his commitment to the University of Alaska Anchorage for the 2019-20 season. “I’m very excited to get things going at Alaska Anchorage,” Frye told MiHockey. “It’s going to be a great place to play and the coaches are great. The 20-year-old forward is currently leading his Jamestown Rebels (NAHL) in scoring with 22 goals, 17 assists and 39 points. “Alex has been a complete pleasure to coach,” said Jamestown head coach Joe Coombs in the team release. “A great kid that we as an organization could not be happier for. Frye played two seasons with Orchard Lake St. Mary’s before making the jump to juniors; in 2015-16, he played for the Chicago Steel of the USHL. 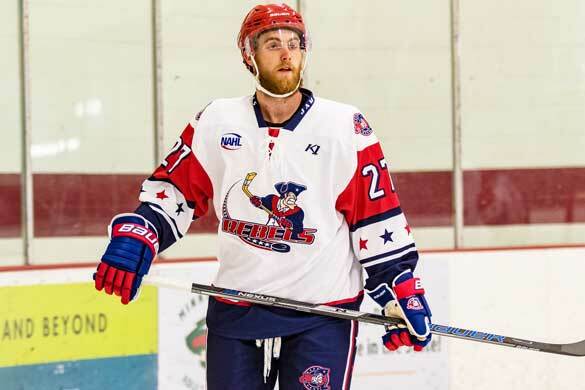 In 2016-17, he played for the Topeka RoadRunners of the NAHL; in 2017-18, he split the season between the RoadRunners and the Philadelphia Rebels. He is currently playing at a point-per-game pace for the Rebels, after the team’s relocation from Philadelphia to New York.